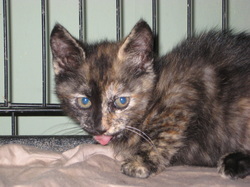 Calypso will have a more flattering adoption photo, as soon as she stops moving long enough for one to be taken! This speedy little girl takes after her mama that way! She loves playing tag, and pestering the dog...she swats his tail and tries to steal his treats. She is an entertaining little sass-pot just looking for someplace to call her own.